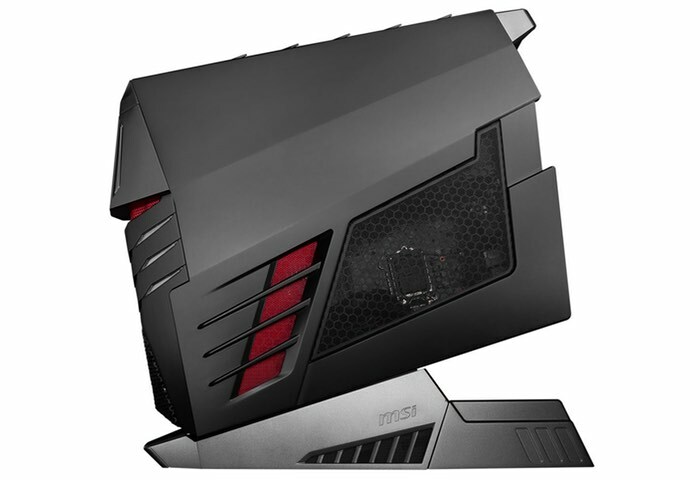 MSI has today unveiled a new addition to their range of gaming desktop systems with the launch of the Aegis Ti takes the form of a 2 way SLI Ready system that allows you to double the graphics card performance. Unfortunately no information on pricing or worldwide availability has been released as yet by MSI for the Aegis Ti , but as soon as information comes to light we will keep you updated as always, check out the specifications and features below. Supreme graphics and ready for VR and SLI – Play the latest games in all their glory with MSI Aegis Ti. It can be equipped with the latest high-end graphics cards. The system is the first to suit a 2way SLI ready. In that way the graphical power can be doubled. And to get the best experience, Aegis Ti has a special front HDMI port, so you can easily connect your VR device to enjoy your games in Virtual Reality. More power when you need it! – At the heart of the Aegis Ti is a powerful unlocked Intel CoreTM K-series processor that can be overclocked without using complicated software or having to open the entire gaming rig. With just a simple push of the Dragon button on the front, the hardware inside is amped up in speed and performance, making games or other complicated computing tasks run even smoother than in normal mode. Silent Storm Cooling 3 – To get outstanding performance Aegis Ti is equipped with a new and upgraded powerful cooling system, Silent Storm Cooling 3. Embracing three separate air flow streams that individually take care of the cooling of different components within Aegis. The unique Silent Storm Cooling 3 design makes sure the system’s temperature stays perfectly under control, ensuring a cool and silent operation. 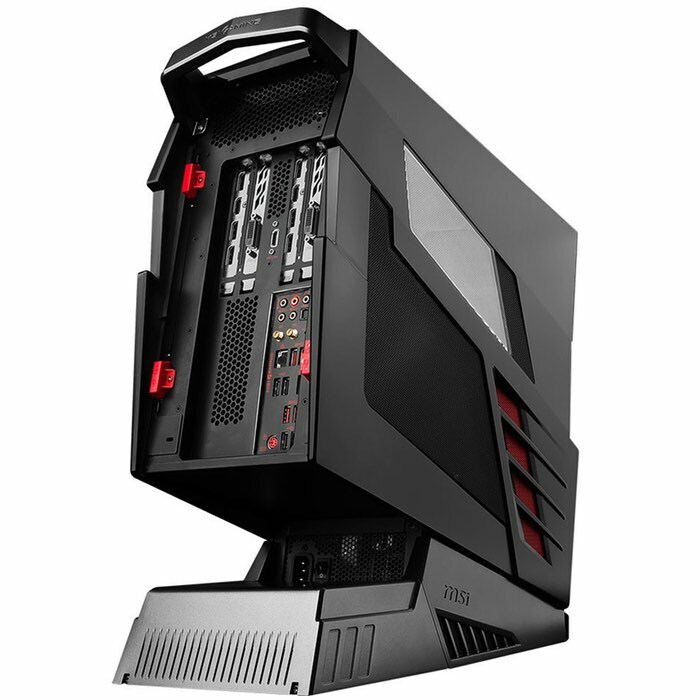 Easy access to upgradable components – For gamers who always want to get the best out of their system, the components of the Aegis Ti are easily accessible and ready to be upgraded at any time. Whether the user wants to expand storage, switch to another CPU or upgrade the graphics card, he can always keep the MSI Aegis Ti gaming rig up to date with the latest hardware. Dominate the game with low latency – Aegis Ti comes with Killer Double Shot Pro, letting the Killer Ethernet connector and Wi-Fi adapter work together for the ultimate high speed attack. It will optimize your gaming connection and automatically detects and accelerates game traffic for a smoother, stutter free in-game performance. Load games in seconds with super RAID 4 – Aegis Ti uses Super RAID 4 to achieve super speeds up to 32Gb/s using M.2 Gen3 x4. Turbo M.2 is more than 5 times faster than a regular SATA III connection! Enjoy a blazing fast system boot and insanely fast loading of games and applications. Mystic Light – Make your build look like it’s on fire or as cold as ice. 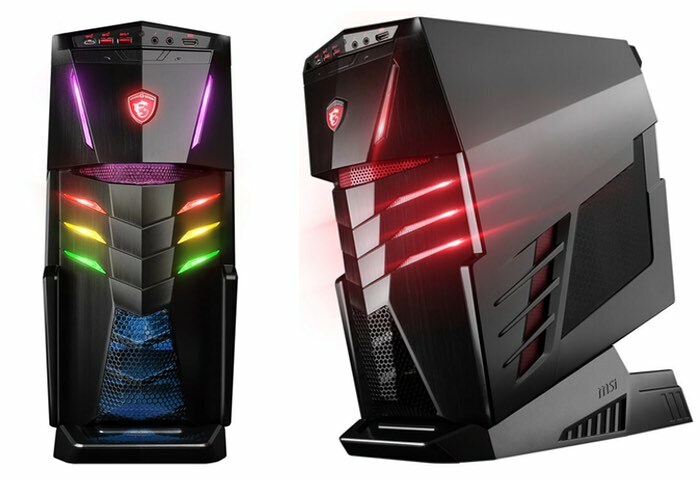 Choose a style with Mystic Light RGB LED built into the front of the case and select any of the colors from the palette to match and give Aegis its own gaming look. Or use breathe, gradient or Gaming & music modes.